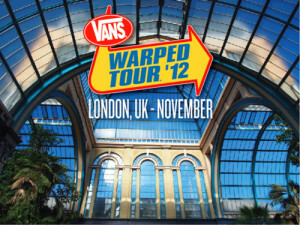 Vans Warped Tour is native to the US, but after 13 years, they will be returning to the UK on November 10th at London’s Alexandra Palace. The line up for the event can be seen below. At this show, there will be four stages for music, many vendors and merchants, and skating ramps! Tickets for the show are now on sale, so get them while they’re hot! The show lineup includes Lostprophets, Bring Me The Horizon (Playing their only UK show of 2012), New Found Glory, Man Overboard, The Story So Far, 3OH!3 AWOLNATION, The Acacia Strain, A Loss For Words, A Skylit Drive, Architects, Blood On The Dance Floor, Bowling For Soup, Breathe Carolina, Bury Tomorrow, Dead Sara, Family Force Five, Me Vs Hero, Middle Finger Salute and Yashin. There will be more bands announced later. Check out a video with more information about the show after the jump. Make sure to check back with UTG for more information about this show!